Kylie and Cricket Memorial Fund: Frederick, MD and The Kylie and Cricket Memorial Fund help little Chihiro! Frederick, MD and The Kylie and Cricket Memorial Fund help little Chihiro! Thanks to everyone’s generous donations the Kylie and Cricket Fund has helped another animal in need! Kingsbrook Animal Hospital contacted Frederick County Animal Control to see if they had any animals in need of medical care. FCAC informed us that they had a tiny kitten named Chihiro that they were concerned about. Chihiro, a 12 week old female domestic shorthair, had a fractured leg that possibly needed to be amputated. KAH decided to see what we could do to help this little girl. Dr. Cook examining Chihiro's leg. 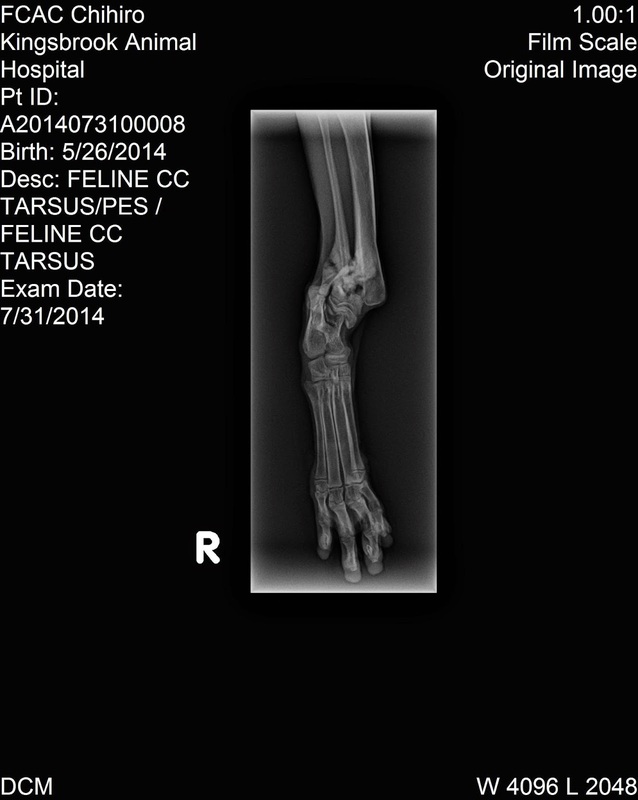 We were able to provide this sweet kitten with a thorough physical examination by Dr. Cook along with digital radiographs of her leg. Although the radiographs showed that Chihiro did have a fractured leg at one time, it had already healed. Thankfully, Dr. Cook determined that Chihiro did not need to have her leg amputated! She will most likely always have a limp, but she seems to be adjusting very well. Chihiro may be more prone to arthritis in that leg, so Dr. Cook recommended that she be fed a prescription joint diet, such as Hill’s Science Diet J/d. Also, Chihiro may benefit from a joint supplement such as Dasuquin. taking radiographs of Chihiro's leg. Our staff fell in love with this baby. She was purring and just wanted lots of love and cuddles from everyone. While here, Dr. Cook diagnosed her with an upper respiratory infection and an ear infection. She is currently recovering, and will be looking for her forever home soon. Thank you again for your support!